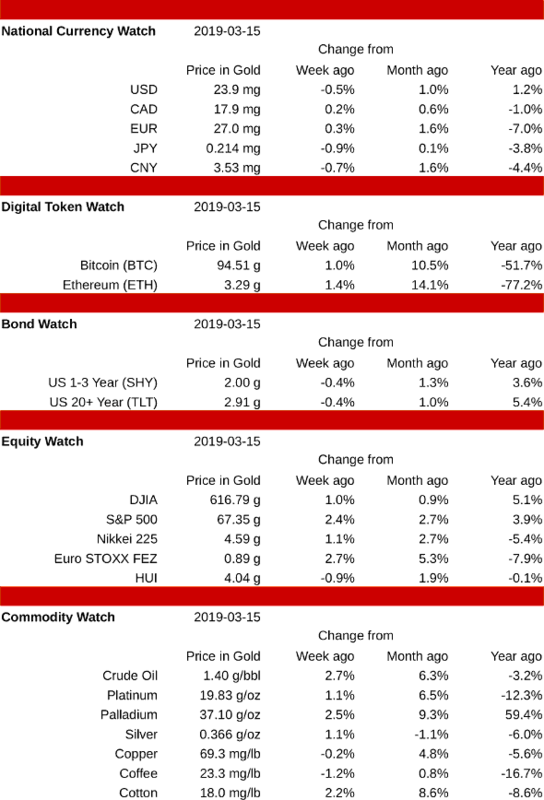 Cryptocurrencies and major stock markets were higher, bonds were lower, and other asset categories were mixed. The largest gains were in crude oil and the Euro STOXX 50 index, which advanced 2.7% each. Coffee fell 1.2%, the week's biggest loss. The best performing national currency was the Euro, rising 0.3%. The Japanese Yen was weakest, falling 0.9%. The US Dollar fell 0.5%, but its bonds rose 1.0% for short term, and 1.4% for long term. Bitcoin fell to a low of 93.0 grams on Wednesday the 13th, then recovered to finish the week at 94.5 grams, up 1.0%. Ethereum followed a similar trajectory, closing up 1.4%. Some smaller cryptos did even better: DASH for example, rose 10.5% for the week, closing at 2.16 grams. Gold stocks fell 0.9%, but all major stock market indexes were higher led by the Euro STOXX, which gained 2.7%. The S&P 500 added 2.4%, but the Dow Jones Industrials lagged, gaining just 1.0%. Crude oil was the leading commodity, rising 2.7%. Palladium also outperformed, adding 2.5%. Coffee saw the largest losses, falling 1.2%. Silver and platinum added 1.1% each while copper declined 0.2%. I have received requests to add currencies to the weekly update, particularly the British Pound Sterling (GBP). While I'm somewhat loath to increase the size of the table, adding the pound has many arguments in its favor, as it is one of the components of the SDR (the only one not already in this table), and much of the world's gold trading takes place in London, priced in USD and GBP. The Canadian Dollar is slightly out of place here, but I had originally included it because many of my readers are from Canada, and much of the resource equity market trades there. If I were to add lines to the table, my personal leaning would be to add additional cryptocurrencies, but it has been very difficult for me to pick one or two of the hundreds of good candidates. I would appreciate your feedback: Add the GBP? Replace CAD with GBP? Add additional cryptos? If so, which?